If you want to enjoy gastronomic journey while travelling through Southwestern Germany, then halt in a small town of Aulendrof, in Baden – Wurttemberg. You will feel like a knight as you get into the hotel Ritter Keller. The hotel has a medieval theme all over. You can have a great pleasure to feel in the medieval castle furnished with all modern utilities. Staffs are very courteous and speak good English. You can have excellent food of your choice here. Extensive breakfast buffet, a la carte menu, seasonal menu are the exclusive plus points of the “ritterkellar” medieval banquet. As soon as you enter the hotel, the maid will greet you as Knight’s cellar. You will feel comfort after she will shower your hands with rose water. As you enter the dining hall, you must consider yourself that you are in the realm of a knight where you will observe long wooden table under the arch of stone. The dining hall is lit up by the candles only. You will observe all the hosts are wearing medieval outfit. They will welcome you to the hotel. 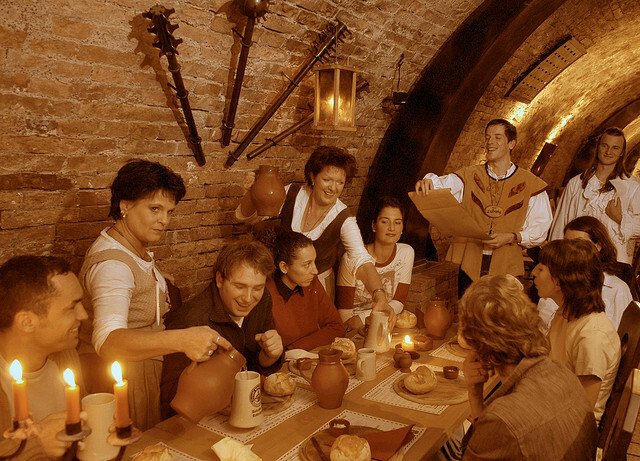 Very soon you will go back to the mediaeval time and experience the gastronomic journey of the era. Above all, they will serve bread loaves along with soups. Then you feel great while tasting the noodles. The hosts will explain you how to follow the old rituals of the knight. As per ritual, someone from the hosts will taste the food to show that all the foods are poison free. Then all the guests will start taking food. The main course will be served soon on the big board decorated with a firecracker in the place of the cabbage. They will serve Vegetables and roasted meat in the main course. You can grab the food from the knightly buffet including vegetables, chicken items, pieces of pork and noodles. Your children will surely like the French fries. The décor of the restaurant is very special. Many old customs, rituals decorations, themes, are just the imagination of the interior decorators. The interior decorations may be very dramatic and unrealistic, but that will take you to the world of mediaeval age where everything was so grandeur. The main dining hall is lit up with dimmed candles. Background music of the old era will surely take you to the mediaeval time. The fireworks and the music create an exclusive knightly ambience. The dim light of the candles add charisma to the whole atmosphere of the restaurant. As we said, few tidbits are taken from the page of history which was the customs of knights in the mediaeval age. Here are few of them which you have to practice in the restaurant while taking foods; you will have to take meals twice a day like the knights who used to have large mid-day meal and lighter evening meal. They don’t consider the breakfast to be that much important. The guests must utter the courtly dialogue, like the knights used to deliver before and after taking meals. The host will guide and help you to follow the customs.